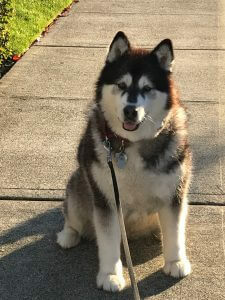 Duchess is a 7-year-old female malamute who is somewhat of a fixture on the Poulsbo waterfront, taking her owners Ken and Amy for walks multiple times per day. You might say she has achieved local star status when you see how many people know her by name. She started limping recently in her left, rear leg and was diagnosed by Dr. Adams with a partially torn cranial (anterior) cruciate ligament in her L stifle (knee) that was confirmed on x-ray. 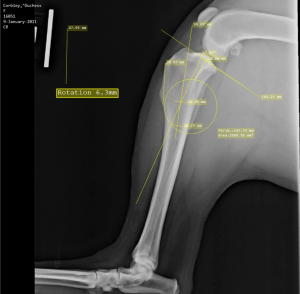 Planning commenced for a CBLO (CORA-based leveling osteotomy). This is the xray image that was used for planning. 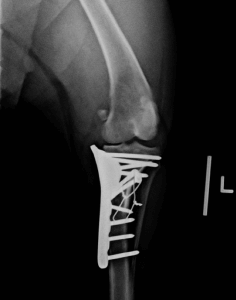 The lines incorporate several landmarks on the bone that are used to calculate where to cut the bone based on the CORA (center of rotational axis), what size saw to use, how far to rotate the tibial plateau, and what size plate and screws to use. 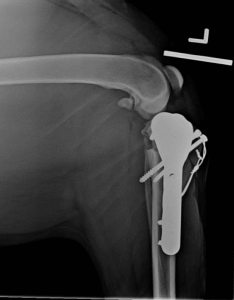 The post-op x-rays of Duchess reveal the placement of the plate and various screws. 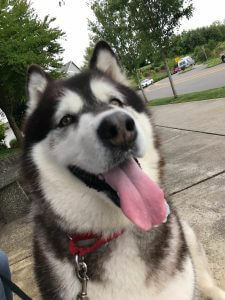 The wire that can be seen is a tension band that is not always needed, but in really large dogs, it adds an extra layer of stability as the bone is healing. Three days post op Duchess is bearing weight very well. All of the dogs go home with special harnesses that allow us to support their weight and help them up until they are confident enough to do it on their own. They have 2 weeks of activity restriction, followed by 3 weeks of leash walking and physical therapy at home. Most are fully healed by 5 weeks and have no activity restrictions thereafter. The hardware usually stays in life-long, but may be easily removed if indicated.